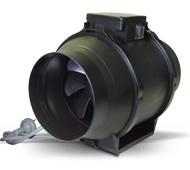 The ProVent Series of in-line mixed-flow fans have been specifically designed for ducted supply or exhaust air applications. There are 6 models in the range matching standard duct sizes from 100 to 200mm diameter. From warm and cool air transfer, to the ventilation of toilets, laundries, ensuites, wine-cellars and kitchens in homes, apartments, hotels and commercial premises. Suitable for both supply and exhaust air applications. All models include plug and lead for easy installation.